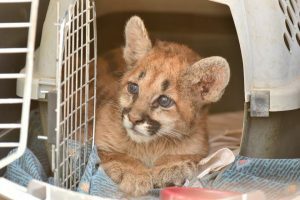 PHOENIX — The Arizona Game and Fish Department is caring for an approximately eight-week-old mountain lion cub found in the Cornville area. The cub was spotted by Cornville residents and reported to AZGFD on three separate occasions. Each time, the reporting residents did the right thing, leaving the animal alone, because the mother of a young animal is typically nearby. In this case, the mother never returned after two weeks and AZGFD biologists determined that in this situation, it was best to intervene. The female cub was picked up from a nearby licensed wildlife rehabilitator and transferred to AZGFD on Friday, Nov. 3. To determine the overall health and condition of the cub, it was given a full examination by veterinarians at the Arizona Exotic Animal Hospital. The veterinarians found the cub to be in poor-to-fair health. Providing a fighting chance for wildlife needing a helping hand isn’t anything new for the AZGFD Wildlife Center, but such a rescue can often be costly. To provide better care for sick, injured, orphaned and confiscated wildlife, AZGFD is planning to build a new wildlife center at the department’s headquarters in north Phoenix. With limited funding available for the project, the department is seeking the public’s help. The public can donate to AZGFD’s ongoing “Be a Hero for Wildlife” donation campaign and assist many different species of wildlife in need by texting CRITTER to 41444 from any smartphone or visit www.azgfd.gov/WildlifeCenter. The cub will remain with AZGFD until a permanent wildlife sanctuary, wildlife park or zoo can be found to give it a forever home. Unfortunately, because it was orphaned it cannot be returned to the wild. Mountain lion cubs spend a year or more with their mom learning critical survival skills. This cub will not have that opportunity. In addition to donations, the public can also help keep wildlife wild by leaving baby wildlife alone. The situation with this cub is an exception, but in general baby wildlife is rarely orphaned or abandoned. One or both of its parents is likely nearby searching for food and will return. For more information on Arizona’s diverse wildlife or the Wildlife Center, visit www.azgfd.gov.